Should kids bring their Bible's to church. I have been going over all our processes. One of them is how, why, when should we be giving rewards for certain behavior. I have two pet peeves that will be finally put to rest. 2. We will NOT be giving kids points/bucks for brining their Bible. This may be a bit controversial but I believe that by rewarding kids for bringing their bibles but never using them teaches them to “look like” a Christian instead of acting like one. I am going to send out a weekly bible reading plan. If they read all the verses at home they get extra points/bucks. I think that unfortunately powerpoint has made bringing your Bible to church a status symbol vs. a functional tool. The other thing that has affected group reading of the bible on the weekend is the rise of multiple translations. I believe learning to read the Bible for yourself is the most import tool these kids need. and you’ll share your bible reading plan with all of us, right? I am so behind you on this. Not only do half of my little guys not know how to read…. I have a beautiful collection in lost in found of picture bibles that have been left behind. I recently found a box left behind from a previous leader full of green bible bucks and wwjd bracelets- i’m all set! Times have changed… Powerpoint, phone bible software’ some churches even hand out the preachers notes. I am so in agreement- well said!!! I couldn’t agree with you more. I know that if I reward kids to bring a Bible to church, there is a 17.4% chance they are going to leave it at church… and it’s not doing them any good there. I put all the verses we use on powerpoint and I provide Bibles for small group time. Yes, times have changed and I do not believe we dishonor the Holy Bible by asking kids not to bring it to church. I do personally feel that kids need to have times where they are engaged in Bibles at church, often times that is where they’ll learn to use them. But let them keep their Bibles at home where it will be right where they can read it. Thanks guys for your thoughts. I didn’t even think of lost bibles. We have tons of them as well that do no good a church when they need them at. Home. I will email you all my first draft to get your insight. I think as Christians we need to never stray from our values but learn how they will be and can be realized in our day and age. I always want to be careful to help our kids realize the power of God not settle for some form of Godliness because I brought my bible to kids church when I was a kid so that is how it has to be done in the future. Thanks again for jumping in the conversation. Thanks for your article, We have started having the children use their Bibles more in the Kids Programme we run. We wanted them to think of there Bible as being there tool for finding out more about who Christ is and what he wants them to do and what he has done for them. They think that it is great bring their bibles and will go back into the adult service to collect their bible if they forgot it. Just a thought if you are having the kids bring Bibles, we have the kids having old school Bible races – “put your closed Bible in your lap, hands in the air…” – and then give them the reference for the scripture or passage we are going to use. Growing up having to use my Bible since we weren’t so technologically advanced, I think it is crazy how kids these days have no idea where anything is in the Bible. Sometimes when we do the Bible race, the kid who gets there soonest will get a prize, sometimes not. 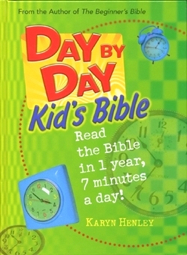 But it encourages the kids to know where things are in their Bible and to actually read it. And they actually like doing it. A lot of the kids I work with now, well all of them really, are getting no Christian/Bible teaching outside church, so if they aren’t bringing their Bibles to church and learning how to use them and read them, they very rarely are going to do so at home. An at home Bible reading plan would be hard to put into place with the homes most of these kids come from, but it is definitely an interesting idea. How do you verify that the kids have read the passages? NIkki thanks for you thoughts and for the link on your site. Katie – I think that those are excellent suggestions. My whole thing is be intentional if you are asking kids to bring their bibles actually have them use them. As far as verification that the kids read the bible verses I would require the parents to sign the sheet use it as a tool to help parents and kids connect. Maybe in time even do a full blown parent kid devotional. Any way thanks all for your great thoughts and idea. Sam good blog topic. I am still taking the direction of encouraging the kids to brings their Bibles to church, but we use them. I have teams of people who when it is time to open the word and begin that segment of our service, they walk around and if a child can’t find it they hold their Bible up in the air until someone can help them. We wait and program the appropriate amount of time to allow all the kids to get to the spot. I don’t want to teach the kids to leave their Bibles at home because that is the place for them, even though I know that is not what you are saying, but I wonder if it is a possible unspoken message like your friends feeling like a trout. I enjoy hearing hearing how kids have begun to bring their Bibles to not only church now, but some are taking them to school and reading during free time. In restaurants their Bibles are being used as well and it has opened up the door for many of my kids to share what they are reading with those around them. I love the idea of the verified study at home and will begin to adopt that this Sunday. Keep up the good work, I appreciate your heart. I see just as many adults leave their Bibles at church as I do kids. It also appears that they often times come from the same families. I wonder if there is a connection?